Dimensions: 14 x 10 in. 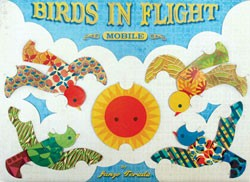 Includes: 2 metal rods (6 in and 16 in), string, materials for 5 hanging mobile pieces, full-color illustrations. Sturdy and easy to assemble, this dynamic mobile is perfect for any room in need of flight and fancy—nursery, classroom, home, or office!